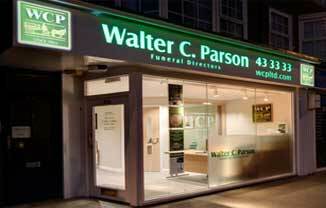 Crownhill Funeral Directors Walter C. Parson is a family business established in 1842. It has, either by inheritance or acquisition, remained in the family over seven generations. We opened our Head Office in Crownhill, Plymouth in 1988, enabling us to serve a larger area of the city and beyond. “The Firs” is situated in easy walking distance of Crownhill Police Station and opposite the petrol station on Budshead Road. Harriet Smith and Paul Tubb are the two resident Funeral Directors for the Crownhill area and are available to help guide you through all the necessary arrangements. Feedback: "Nothing was too much trouble for you or your amazing staff"
Feedback: “Thank you for your incredible professionalism, and kindness. You were calm, witty & empathised so well." Feedback: "Your kindness and attentiveness has been a blessing." Feedback: "Thank you for your kindness, sympathy and Patience"
Feedback: "Many thanks for the excellent order of service. Seeing it in its intended form allowed me to appreciate its layout; you certainly know your craft".